If you played the original prototype of Superhot, the final game is simply more of that. And, frankly, that’s all it needed to be. The game jam version’s clever use of time manipulation resulted in a fun and stylish take on first-person shooting that had a ton of potential. It was easy to see how a full game could flesh out its concept and the final game does so fantastically. What makes the final game interesting and unexpected, however, is its use of narrative and how it ties into everything. 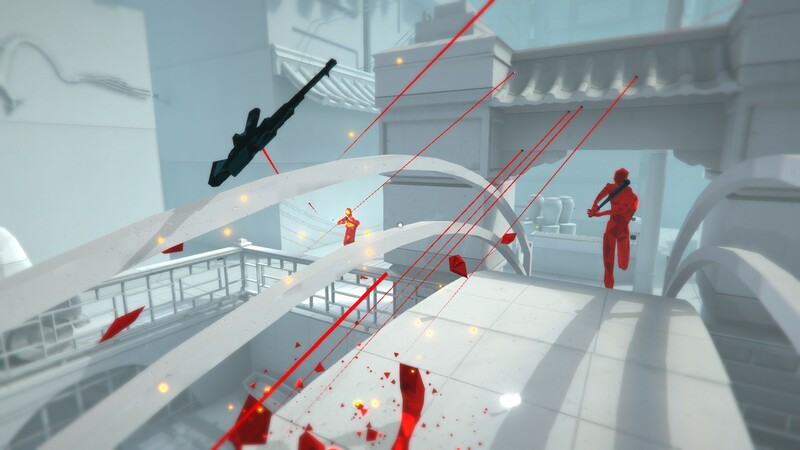 If you didn’t play the prototype, Superhot is a first-person shooter where time moves with you. If you stand still, time moves forward at a crawl: bullets creep toward you and red gunmen slowly advance, granting you time to look about and assess the situation. Once you start moving, time passes at normal speed and with it an almost assured swift death. You use these time manipulation abilities to dodge bullets and gun down, slice through, and clobber armed goons through a series of quick stages. Each one starts off with a terse message that flashes across the screen to set the scene. From there, you move obtain a weapon, whether by disarming someone or grabbing the nearest object, and get to work. Clearing the area of foes is an exercise in patience. You may be able to cheat death by moving carefully to avoid any potential gunfire, but you still need to consider how you approach each scenario. Recklessness won’t get you far. Superhot is methodical and deliberate. You need to constantly aware of where each enemy is and which are about to fire. Because even with everything moving in slow-motion, one wrong move is all it takes for everything to fall apart. That’s in part due to how every little move you make speeds up time slightly. Every movement matters. Looking around will make incoming bullets zoom ever closer to you if you’re not careful, leading to the occasional death you can’t hope to escape from. Eventually you gain the ability to jump between bodies, which opens up a bunch of new opportunities for kill streaks. Where before you’d have to carefully assess each situation and figure out who to prioritize first, with hotswap at your disposal, you can easily rectify any mistakes by jumping to whoever just fired that shotgun blast hurtling toward you. The only downside is that whoever you jump into will immediately toss their weapon, but that only makes it all the more important to be careful about who you possess. You don’t get this ability until late into the game, but once you do, it makes the most of it. You arrive on each level with no context for the situation. The very first level begins following a gunshot, one of those red goons falling backward and shattering apart. You’re told how to move and shoot and nothing else. The situation is never touched on, the game unconcerned with providing background. 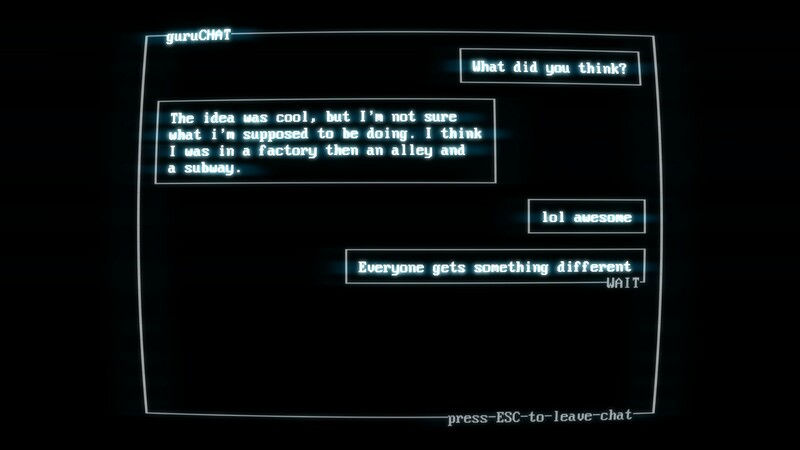 Some of the lines of text that flash across the screen allude at what’s going on in each level – “It was a setup” accompanies a level set in a back alley, for instance, whereas “Shutting down the operation” appears while breaking into a lab – but it’s hardly enough to go on. They’re purposely self-contained scenarios, nary a hint of connective tissue between them. They aren’t meant to congeal into some greater narrative, but simply serve as stages to clear. The story instead takes place in between levels through an ASCII-based operating system that serves as the main menu. The premise for Superhot is that a hacker friend of yours sends you a copy of Superhot and tells you to play it. You do. As you play through it, however, the program tries to bar access. First by locking you out via an “access denied” message, then by locking the rest behind a password prompt. The deeper you go, the more the program starts to actively fight back. It quickly becomes clear that Superhot, the program, isn’t just some game but something powerful and dangerous. It starts talking to you directly, ordering you to stop playing around or else. Without spoiling anything, the story takes some wild turns, going so far as to incorporate sharing replays and even recommending the game to others into its fiction. When you finish Superhot, you unlock an endless mode as well as a wealth of challenge modifiers. The game hits its stride here. The endless mode allows you to improvise, leading to all kinds of ridiculous chains of kills. Throw a couple punches to disarm the nearest target, then take their pistol and take out the person right behind them, only to throw it at another target rounding the corner behind you to stun them and take their shotgun and use it against them, and so on. One my better runs had me running through a small market cutting through foes using only a katana. Every time I swapped bodies, I’d throw the sword somewhere near my target so I could pick it back up and resume slicing through the endless horde of gunmen. The thrills of Superhot are at their best here, allowing you to play with the mechanics to their fullest. The challenges, on the other hand, provide dozens of ways to keep playing through the main levels interesting. They emphasize the puzzle aspect of Superhot. The challenges force you to rethink your approach to each level, to be extra methodical. Playing through the game using only a katana made me think a lot more carefully about how I tackled each level, which enemies I should prioritize, when I should throw my katana or move in for a swing. Whereas playing with hotswitch enabled from the start gave me more leeway since I now had a safety net on levels I previously didn’t. Though the endgame modes are where Superhot hits its stride in terms of play, it’s the story that really makes it worth seeing. There’s still tons of little things about it I’m still curious check out as well as plenty I missed, I’m sure. It’s a bit of shame there isn’t more to the main levels themselves, though, as without the story supporting them, they’re not nearly as fun to play through, even with some of the challenge modifies enabled. Still, that hasn’t stopped me from going back to it regularly to keep trying my hand at them. It’s well worth your time.